JavaMapWriter writes JavaBeans (represented as HashMaps ) into a dictionary. This allows dynamic data interchange between CloverDX graphs and external environment, such as cloud. The component is a specific implementation of JavaBeanWriter which allows easier mapping. Maps are less restrictive than Beans: there are no data types and type conversion is missing. 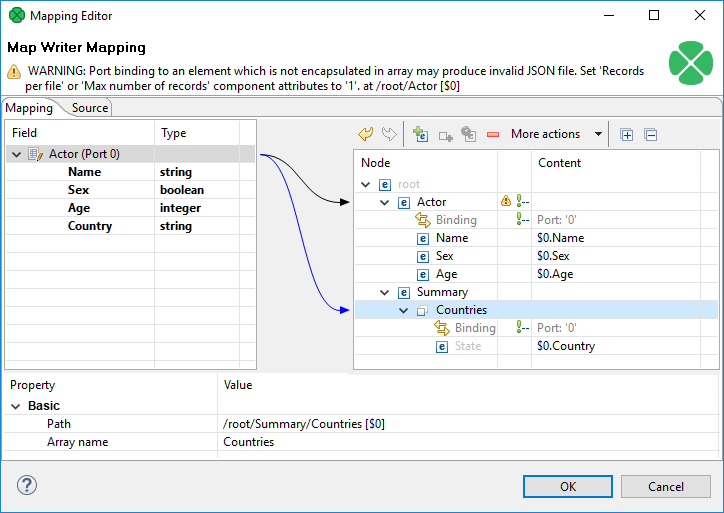 This gives JavaMapWriter a greater flexibility - it always writes data types into Maps just as they were defined in metadata. However, its lower overheads come at the cost of accidental reading of different data type than desired (e.g. if you write string into a Map and then read it back as integer with JavaBeanReader, the graph fails). Dictionary target yes The dictionary you want to write Java Mapsto. Defines how input data is mapped onto output Java Maps. See Details. The external text file containing the mapping definition. The size of the database used when caching data from ports to elements (the data is first processed then written). The larger your data is, the larger cache is needed to maintain fast processing. auto (default) | e.g. 300MB, 1GB etc. Cache data records in memory instead of disk cache. Note that while it is possible to set the maximal size of the cache for the disk cache, this setting is ignored in case the in-memory-cache is used. As a result, an OutOfMemoryError may occur when caching too many data records. Tells JavaMapWriter whether the input data is sorted. Setting the attribute to true declares you want to use the sort order defined in Sort keys, see below. Tells JavaMapWriter how the input data is sorted, thus enabling streaming. The sort order of fields can be given for each port in a separate tab. Working with Sort keys has been described in Sort Key. The maximum number of records written to all output files. See Selecting Output Records. One of these has to be specified. If both are specified, Mapping URL has a higher priority. 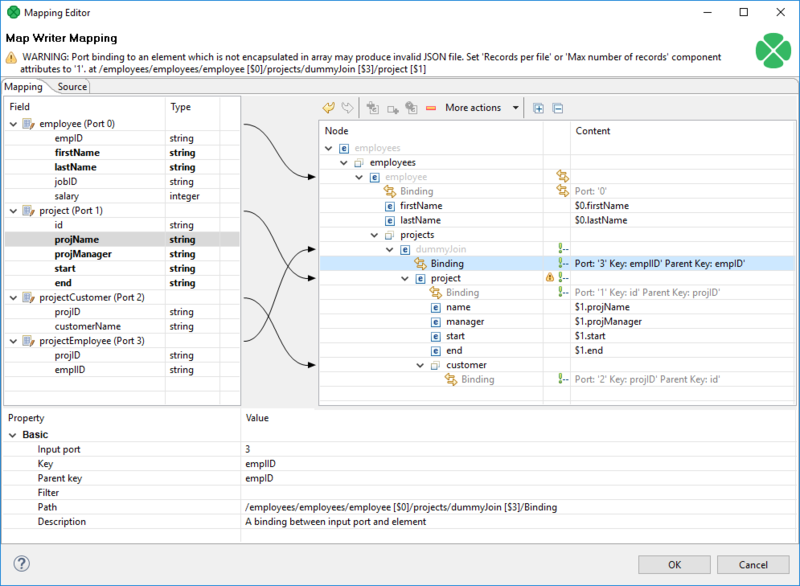 The JavaMapWriter component receives data through all connected input ports and converts data records to Java HashMaps based on the mapping you define. Lastly, the component writes the resulting tree structure of elements to Maps. there are no attributes as in XML. Remember the component cannot write to a file - the only possible output is dictionary. If you are familiar with XMLWriter, you will find the process of mapping the input records to the output dictionary analogous. Mapping editors in both components have similar logic. Figure 56.10. 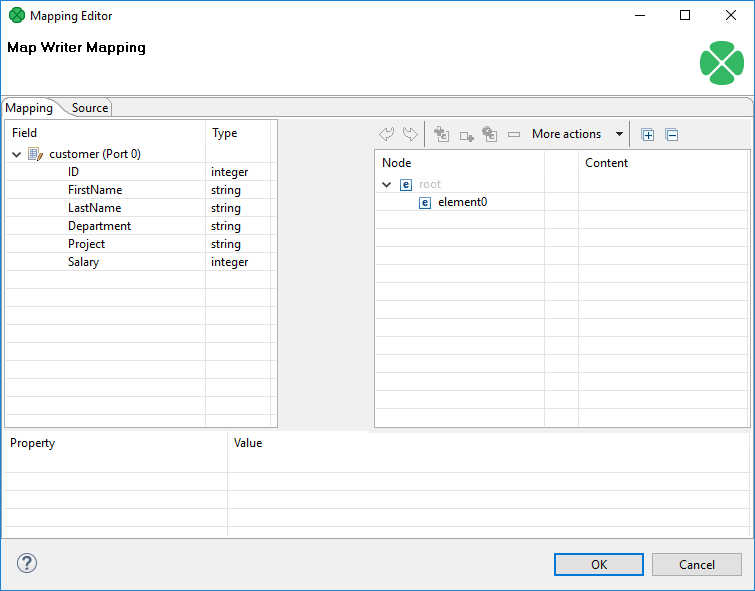 Mapping editor in JavaMapWriter after first open. Metadata on the input edge(s) are displayed on the left hand side. The right hand pane is where you design the desired output tree. Mapping is then performed by dragging metadata from left to right (and performing additional tasks described below). Unlike XMLWriter, you do not map metadata to any 'attributes'. Arrays - arrays are ordered sets of values. To learn how to map them in, see Example 56.5, “Writing arrays”. Wildcard elements - another option to mapping elements explicitly. You use the Include and Exclude patterns to generate element names from respective metadata. Connect input records to output (wildcard) elements to create Binding. In the example above, you can see the employees are joined with projects they work on. Fields in bold (their content) will be printed to the output dictionary. Figure 56.12. Mapping arrays in JavaMapWriter - notice the array contains a dummy element 'State' which you bind the input field to. At any time, you can switch to the Source tab and write/check the mapping yourself in code. If the basic instructions found here are not satisfying, consult XMLWriter's Details where the whole mapping process is described in detail.